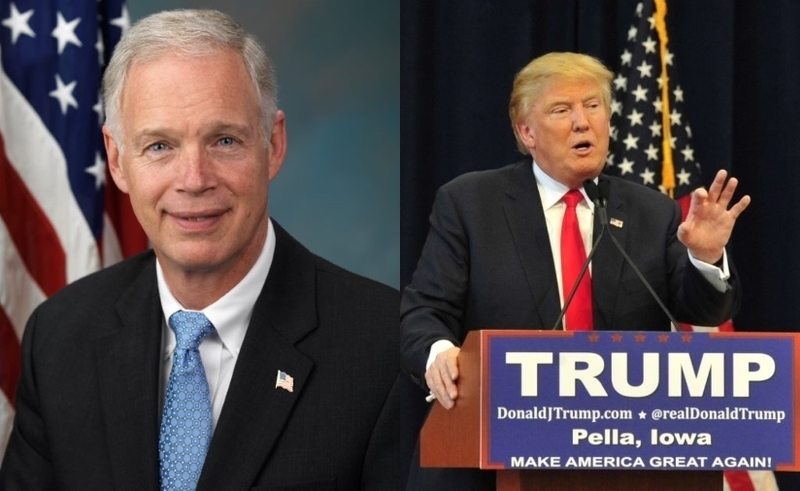 Ron Johnson and Donald Trump. Ron Johnson first ran for office in 2010 as a businessman and patriot, with a kind of Mr.-Smith-Goes to Washington aura, and much of his first term was devoted to lectures about the federal deficit. But the anti-Washington outsider has changed to an almost shocking degree, increasingly turning into a partisan hack who puts party before principles — and patriotism. Never was this clearer than on Tuesday, when Johnson turned hit man against the FBI. “There’s so much smoke here, there’s so much suspicion” of the FBI, he went on. The choice of Fox was deliberate, because Johnson knew he wouldn’t be pushed for proof of his accusations. So “somebody” allegedly talked to the senate committee on this, but Johnson won’t say who. Other than that he is referencing a cryptic comment made by FBI lawyer Lisa Page to senior FBI agent Peter Strzok. The two were having an affair and using their government phones to keep it a secret and made comments about Donald Trump, Hillary Clinton, James Comey and other topics that may or may not mean anything. Just to be safe, Special Prosecutor Robert Mueller removed Strzok from his investigative team after discovering he made a mocking comment about Trump. That’s it. The “secret society” might well be two lover’s private reference to a clandestine meeting, for all we know. Or there might have been some FBI employees meeting off site for valid reasons that have nothing to do with President Trump. These questions would be easily settled, if Johnson and Republicans released all the text messages. Instead, as New York magazine notes, Republicans have for weeks been “selectively leaking snippets of conversation to feed a distorted story line to the media,” in order to undermine the ongoing investigation of alleged collusion between Russia and the Trump administration. Johnson and the Republicans are trying to suggest an entire federal agency, the long non-partisan FBI, is biased against Trump and the GOP based on cryptic messages between two adulterous employees — out of 35,000 who work at the FBI. Never mind that law enforcement and military personnel are far more likely to vote Republican. Never mind that the Republican Party has long took pride in being the law-and-order party that is pro-FBI and anti-Russia. Suddenly Johnson and a select number of Republicans (it is certainly not the entire party) are now standing on their head to reverse their positions, throwing mud at the FBI and reinforcing the criticism of Trump towards the FBI, CIA and the other 15 intelligence agencies who concluded that Russian cyber attacks targeted the American elections with a goal of getting him elected. This is an attack on the entire national security infrastructure of this country, whose job is to protect this country from such attacks by hostile foreign powers and an implicit defense of the dictatorial, criminal, anti-American regime of Vladimir Putin. Wisconsin blogger Gregory Humphrey has compared Johnson to the most infamous senator from this state, Joe McCarthy. McCarthy, however, peddled his character assassinations and Communist conspiracy theories for years. But it’s worth noting that McCarthy operated as a lone wolf, while Johnson is the Chairman of the Homeland Security and Governmental Affairs Committee, whose mission is to protect all Americans from threats to our security. And what is more vital to a democracy than the safety of its electoral process? Yet Johnson has shown little concern about this threat. Recall, that as chairman of that committee, Johnson was one the so-called “Gang of 12,” the top 12 congressional leaders, who were invited to a September 2016 meeting where U.S. intelligence officials “laid out the evidence U.S. spy agencies had collected, showing Russia’s role in cyber-intrusions in at least two states and in hacking the emails of the Democratic organizations and individuals,” as the Washington Post reported. As I wrote a year ago, Johnson had an opportunity to be a patriot and condemn the fact that Russia was engaged in such activities. But he issued no resolutions — not one word — on Russian’s cyber attacks on America. Worse, he has engaged in a pattern of misinformation on the subject, undercutting a CIA report in January 2017 concluding that Russia meddled in the presidential election to help Trump win election. He issued a statement to the Wisconsin State Journaldoubting the report and went on to complain to CNBC that the CIA refused to brief him on Russian hacking, saying “I have not seen the evidence that it actually was Russia,” while failing to note the report echoed the briefing he’d received from other intelligence leaders in September. Nor has Johnson addressed the evidence that Russian cyber attacks may have had an impact on the election results in his own state of Wisconsin. Dan Bice and the Milwaukee Journal Sentinel did a flaccid story detailing Johnson’s charges to Fox News and then suggesting it was disputed only by “liberals” and supported by conservatives. The net effect was to give his irresponsible claims credence. This is supposed to be the province of Journal Sentinel Washington Bureau Chief Craig Gilbert, but he steadfastly avoids any such controversies and nearly anything that happens in Washington. Some 16 months after Johnson met with the U.S. intelligence experts to learn about the Russian hacking of U.S. elections, the newspaper has yet to let its readers know this happened. Ron Johnson is a joke. He’s in Alex Jones territory now. RoJo was on NPR this morning. This is how it went. Greene cut the senator off. It was at least the third time in one interview that Johnson, when asked to explain how these texts demonstrate large scale bias and corruption at the FBI, had veered into an investigation that ended more than a year ago. Talk about ‘cryptic texts.’ Why, what could they mean?? It’s so subtle and textured. Just one example, BTW. What exactly is that proof of WashCoRepub? Other than two people in the FBI having an affair texted each other. I know you don’t believe that it’s proof of some sort of nefarious agency plot to impeach Trump. You are an extreme partisan but you have to be smarter than that. RoJo used the word “probably” about a dozen times in the NPR interview. That alone is a great indicator that he was making up the whole episode. And I think that RoJo was the first elected official to utter the term “diddly squat” on NPR. Sad. The Republican Party has not only become the White People’s Party, but is now beholden to elements that are racist and, in some instances, openly fascist in the classical definition of the term, supported by the enormous financial might of major industrial sectors and the hyper-wealthy, like the extremist Mercers, Kochs, Adelson, Hendricks and others. It is not possible to understand what is happening without watching Fox News, the semi-official Trump Administration news agency, our version of TASS or some third world state outlet. It is part of an echo chamber that broadcasts a steady stream of lies, but lies that their and the administration’s fans want to believe. The secret “memo” being just the first vehicle, after Benghazi, the e-mails, Uranium One, and others. All with a racist and nativist sub-text. Next, the flood of information about the misdeeds and crimes of the administration and its leader is so overwhelming that individual items get lost in the litany of “breaking news.”, As our moral and ethical norms collapse, the $130,000 payment by the president as hush money to a prostitute becomes a one day story, one that would have been headline news for years in the past; and inevitably provokes a right-wing “what about” response, as in “what about Monica Lewinsky?” followed by the lies that liberals were accepting of Clinton’s behavior and that he got away with it (he was impeached.). The world’s self-proclaimed greatest democracy, the home of a similarly self-proclaimed “generous people” is about to deport 3/4 of a million young people to countries that they have never known, because, contrary to the lies Republican leaders tell us about wanting to “solve the problem,” their base wants to get rid of these, mostly non-white young people and make sure that more like them don’t come here. While the United States is not a cruel country, power is currently in the hands of – and beholden to – cruel people. For a majority of Americans, this horrific action will be a moral stain that will haunt us for decades to come. For the Republican base, it will be good riddance. Finally, there is the ominous trend, typical of autocracies and dictatorships, of threatening your political opponents with prison, as in “Lock her up.”Ron Johnson may be a cipher and a mediocrity, but autocracies and failed democracies always float on a sea of ciphers and mediocrities. Enormous damage is being done to our country, much of it may be irreversible or take decades to fix. If it is to be fixed. Democrats and media shocked Trump won and announce Trump colluded with Russia. FBI Director leads an investigation that so far bares no fruit. Media and Democrats keep insisting the Russians have poisoned are elections. Republicans are in the position of proving that there is no collusion. Republicans are not allowed to prove innocence. @Troll, What? Sorry, wrong again. Trump will have every opportunity to “prove his innocence” when he chats with Mueller. Just like Flynn did, Sessions, Bannon etc. Terry, if you and I live in the same house with Jesus and Jesus goes missing for three weeks. I then call the police and state I think Terry killed Jesus. Is it Terry’s job to prove his innocence. According, to the Democrats Trump is at fault with no proof. How does Terry become whole after alleging that he killed Jesus? If Republicans are trying to prove there was no collusion, they are doing an absolutely terrible job. Ron Johnson is exhibit A. And you are being disingenuous Troll. Plenty of Republicans believe Russia poisoned the election. Because they did. There is plenty of evidence that they did, and they are trying to poison elections in other countries as well. There was a time when people like you believed Russia was the enemy. Trump tried to fire Mueller last year but didn’t when the White House Counsel threatened to quit. But sure there was no collusion. Is it normal to accuse a roommate with murder, when there’s no other reason to believe they did it? Sounds like sloppy detective work to me… par for the course with Troll. Troll WTF are you talking about? BTW why would anything be brought up until the investigation is completed. So tired of hearing this argument. Your nickname should be Russian Troll. @Troll, calm down. Republicans and Trump are getting their due process. This is not the Napoleonic Code here Troll. You seem to be conflating what the media/culture at large is saying with an actual ongoing legal investigation. They are very different. You also somehow seem to not understand or have realized yet that republicans and the right wing lost the culture war a long, long time ago. They do still cling to political power however but they are indeed getting their due process and have plenty of time, means and ability to state their case. Trump is an illigiment president. He lost the popular vote. The evidence of collusion with the Russian’s is overwhelming. If a text message between two lovers is a crime, we would all be going to prison. ROJO is an example of what is wrong with our government. GOP corruption in Wisconsin has corrupted our elections, prior to Russian interference. Just look at what they are doing now to kill their own ethics and election commission. Keep it up ROJO, you time out is coming. Ron Johnson and Scott Walker bring a small town chamber of commerce mentality to Madison and Washington. Unfortunately, our fine state has enough small minded tea party types that the clowns will keep getting elected. He’s appealing to them because he knows it will work given our current demographics, so no big surprise that he’s making these vague accusations up because it won’t hurt his political future.